RecTennis brings affordable, accessible, and fun tennis programs to Pacific Northwest communities. Check out which media outlets have featured us, and why they’re telling our story below! Check out our feature on Portland Today to hear about our different program offerings in the Portland area including summer camp, friends + family tennis, hiit tennis + next level tennis. With equipment for all ages + skill levels, Portland Today learns what makes RecTennis a fun, + safe learning environment for all. Out & About with Drew Carney talks our Tennis Afterschool Zone programs, + how we provide after school tennis in pacific northwest area schools. The Wake Up Show talks about a fun affordable way to get the family active! Join us for our friends + family tennis programs, located in six locations throughout Eastern Washington and Northern Idaho. 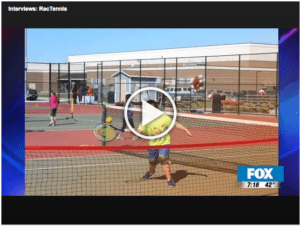 Check out Good Day Fox’s feature on RecTennis + how we partner with Spokane parks + recreation to bring tennis to the Spokane community.